Ich hab ihn gesehen, er ist unterwegs. 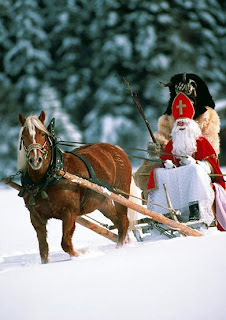 Einen frohen Nikolaus-Tag! We lived quite a few years in the beautiful land of Austria. Today is St Nicholas Day there. It's December 6th. First on December 5th we would get visits on the door from Krampus, a beast-like creature who scares the children who are bad before Christmas. I remember the stores in Austria being full of chocolates and things shaped as Krampus. Parents would scare their children and say Krampus would get them if they were not behaving. I had a discussion with a lady in the store once there, as I thought the devilish-looking candies were horrible as children's teasers in the month of Christmas. And the beauty of this tradition is what happens today on the 6th of December. St Nicholas comes and saves them all, gives gifts, and brings hope and happiness. On this day we would get visits from young people dressed as the Christmas saint, more like a bishop. He would want to know if the children had been good, polite, and helpful and ask for a small donation. I miss Austria. I loved living there and I am grateful for the experiences and friendships I formed there - and that formed me. Today's water color is one I made as an illustration for a Christmas song book. The original was stolen from the author's car in central Europe somewhere, but I fortunately have this photograph of the painting. 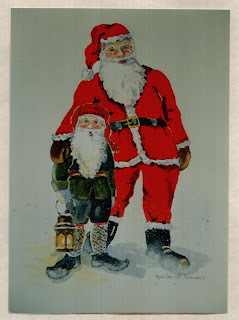 It depicts the Norwegian "nisse" and the American "Santa Claus". Takk, Vilde. Du har jo vært mye hos oss i Østerrike. Til og med i juleferien.